I’ve gathered some creative tutorials, free printables and just plain fabulous ideas to help make your Halloween extra sweet this year! There’s a little something for your home, gifts for friends and ideas for you children to share at school. 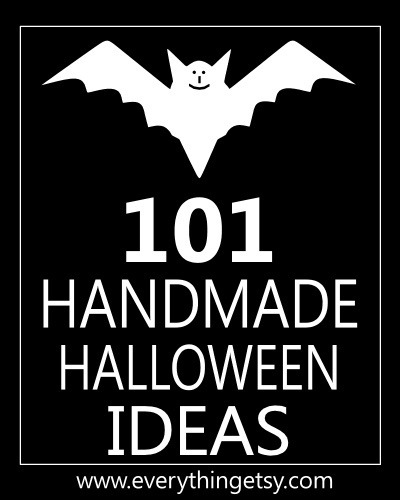 It doesn’t have to cost you an arm and a leg to decorate for Halloween! 🙂 Don’t miss the printables…I love, love, love them! Bat Ribbon Party Straws – Scrapbooks Etc. That’s a bunch of Halloween fun! I know there has to be the perfect project on there for your home. What did you think about all of the creative and creepy wreaths? Wreaths are always one of the first things I start with for each holiday. They’re quick and make a big impact! 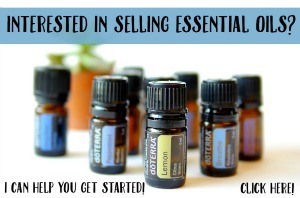 Feel free to share this list with your friends! 🙂 Thanks so much for all your pins, stumbles, tweets and blog posts about my previous 101 holiday posts. 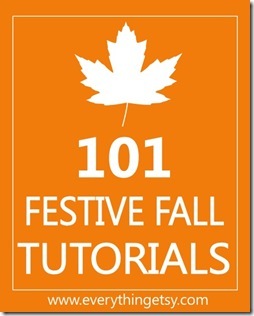 If you are looking for beautiful fall ideas and like to have some decorations that you can leave up through Thanksgiving…101 Festive Fall Tutorials is for you! Check out all the classy ways you can add a touch of fall to your home without spending a ton. I hope you all have a fabulous handmade holiday! Thanks for including 2 of my projects in your round-up! I love ALL of these ideas!!! Great round up! Thanks so much for including me! Angie – I love your tutorial…Knock off crafts rock! 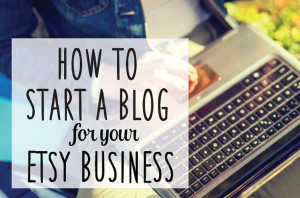 Your blog is full of creative ideas and I really enjoy getting it in my reader! What an awesome list! So privileged to be included in the list! And happy to see so many of my friends here too! Thanks! Heidi – Thanks for stopping by! You are a super crafty girl and I’m sure I’ll be sharing more of your tutorials in the future. Woohooo! I just love your roundups – thank you so much for doing a Halloween version! I always love when you put these list together and then there I AM featured too among such crafty people! Thanks! Thanks for including my Frankenstein Goodie bags! I appreciate you. Love this roundup! I’ll be busy from now til Halloween now 🙂 Thanks you so much for including my spooky screens in your list! Thanks so much for including me !!! Great tutorials! I’m very excited that its this time of year again. My fav!!! What a great list of DIY. These are great ideas! thank you so much for sharing them! Awesome! Can’t wait for Halloween! Thanks so much for including my burlap witch wreaths! What a great round-up! Thank you for including our burlap spider wreath. Love your round-up! Brilliant list! Can’t wait to visit all the ideas and get making! My little boy’s going to love all the things we can make. Thank you for including my blog printables, Kim! Great roundup! Very good blog , thank you very much for your time in writing the articles . Hello, thanks for showing that beautiful ,creative ideas for Halloweeen. What a handy resource! Thank you for putting these great ideas all in one place for me to make my life easier! Next Post Share Your Craft Space!